Red Squirrels are not a pest. The grey squirrel, first introduced to the UK from the USA in the late nineteeth century, definitely is. It is now common throughout the UK. Outdoors they cause severe environmental damage, stripping bark off trees causing young trees to die, and can destroy many garden plants with their activities. In urban areas they will readily inhabit lofts, attics and roof spaces as well as outbuildings. They chew woodwork and ceilings, strip the insulation from electrical wiring, tear up loft insulation to form a nest and sometimes drown in cold water tanks. Signs of their presence will be scratching noises and droppings. Agouti pest control technicians will remove your squirrel problem by laying suitable traps and baiting where appropriate. 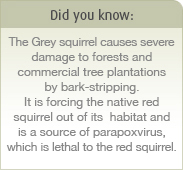 For your FREE Squirrel eradication assessment and quotation contact us today.